Trump said he even paid for their meal of "American fast food" because of the partial government shutdown. He did not disclose the tab. "We went off and we ordered American fast food, paid for by me. Lots of hamburgers, lots of pizza," Trump said after returning to the White House from a trip to New Orleans. "I think they'd like it better than anything we could give." "We have some very large people that like eating, so I think we're going to have a little fun," said the president, a fast food-lover himself. "I had a choice," Trump said. "Do we have no food for you? ... Or do we give you some little quick salads that the First Lady will make, along with the Second Lady — they'll make some salads. (No), I said, you guys aren't into salads." 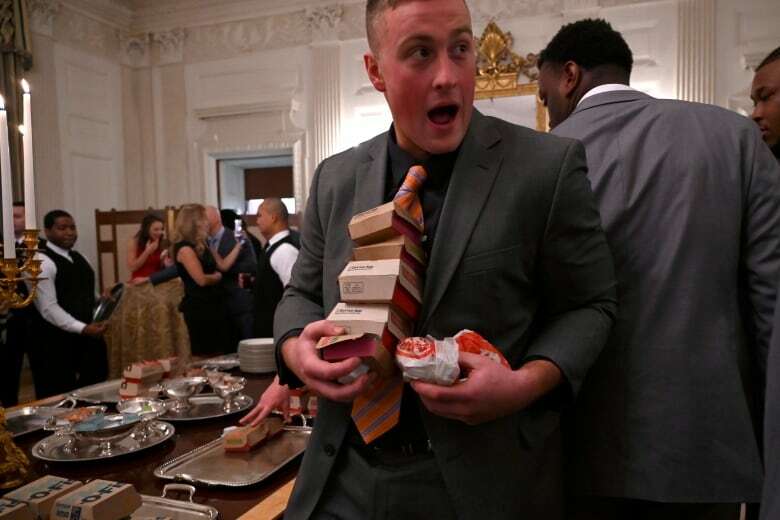 Spokeswoman Sarah Huckabee Sanders said much of the staff that works in the White House residence has been furloughed due to the shutdown, "so the president is personally paying for the event to be catered with some of everyone's favorite fast foods." An impressive — and highly unusual for the White House — smorgasbord greeted the players in the East Room. Silver trays held stacks of wrapped burgers from Wendy's and boxed burgers from McDonald's, including Big Macs. 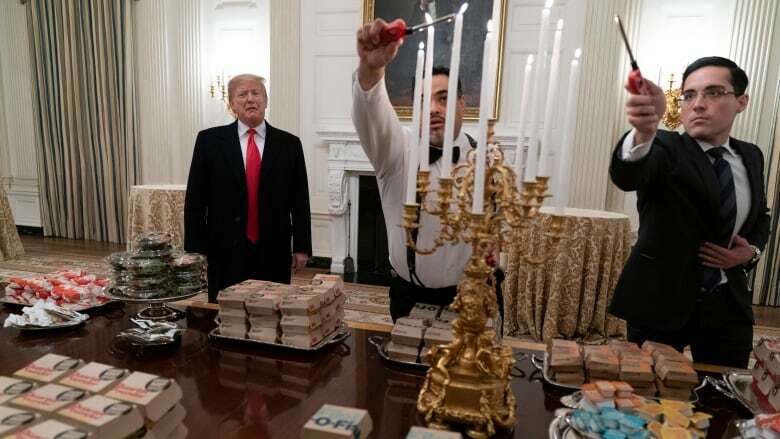 White House paper cups bearing the presidential seal held the fries. Pizzas, some topped with olives and tomatoes, also were on the menu. Silver bowls held the condiments and stacks of white china plates sat nearby. Clemson coach Dabo Swinney has nominated this season's undefeated Tigers as the best college team ever. Trump calls them a "great team, an unbelievable team."